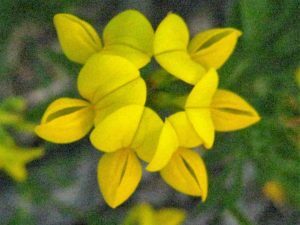 Home » flowers » Birdsfoot Trefoil: What’s in a Name? 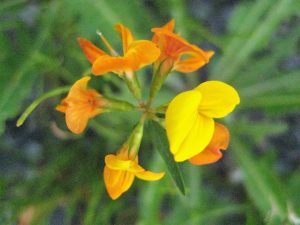 Birdsfoot Trefoil: What’s in a Name? Almost no one knows the name of this flower; everyone knows what it looks like. Wherever you live, you probably see it on every summer’s day. It’s the froth of little yellow blossoms that line the roadways, decorate highway medians, and pop out of cracks in the sidewalk. Such a strange name. The flower doesn’t seem to have anything to do with a bird’s foot. I have to say it actually bears an uncanny resemblance to popcorn. 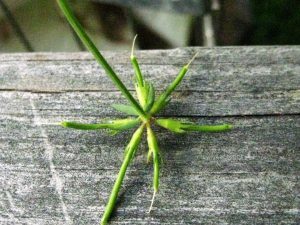 It’s one of the many members of the clover clan, as you can see if you look at the leaves—they look like skinny three-leaved clovers. “Trois feuilles” means three leaves in French, so that’s where the trefoil part of the name comes from. But what about the bird’s foot? You have to take a look at the seed pods. As the plant goes to seed it turns a shade of reddish brown, which gives it another common name: bacon and eggs. At first the seed pods just resemble little string beans, or pea pods, as well they should since they’re in the same botanical family as peas and beans. But flip it over, and there’s the bird’s foot, a perfect imitation right down to the toenails.